Today is payday which means I went and spent most of my salary on cosplay for the Manchester Comic Con! Me and friend B decided way back in February we were going to a Comic Con this year and that we were going to cosplay on both days, and I am happy to say that B also jumped at the chance and we bought our weekend tickets there and then! The convention isn't until the weekend of 19-20 July (taking place at Manchester Central - details can be found on their website) but with almost all cosplay 'stuff' being sourced from countries like China we thought it best to order as early as possible to give plenty of time for mistakes, returns, confusion and so on without the drama! I'm going for one day as Belle from Beauty and the Beast, wearing a costume I made myself for an American Theme leaving party for D & E who left to live in San Francisco earlier this year - so sad to see them go but me and all the girls got to dress up as Disney Princesses which was a wonderful way to say goodbye! 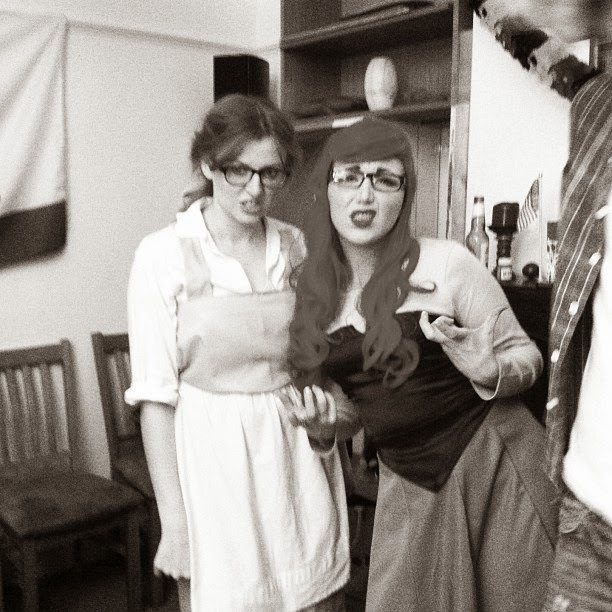 Here I am in my costume along with E who is Aerial from the The Little Mermaid - we were being rather hipster in this picture but I LOVE it as I love her (and miss her dearly!!) I'm planning on improving the outfit slightly to make the skirt fit better before July but at least it is made already! expect a better picture when we go to comic con! 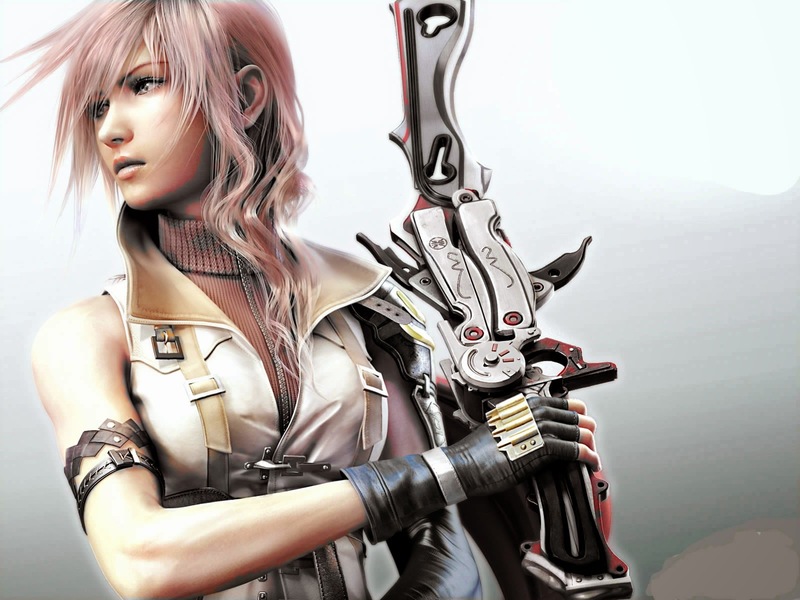 On the other day I am very excited to be dressing up as Lightning Farron from Final Fantasy XIII - one of my favourite games of all time - after Kingdom Hearts/2/Birth By Sleep of course where my heart truly lies (but I don't like Kairi at all and would never dress up as her). I have just ordered this costume from Ebay and the price is a little steep but I really want to cosplay properly and have budgeted for the cost (phew). I have also ordered (what I hope will be) a beautiful pink wig to do the job 100%! Luckily I already have some tall brown boots and don't need to buy those! I can't wait to practice my hair and make-up and show you guys! B is going as Cloud Strife (Final Fantasy VII - but you already knew that, right?!) one day and 'Hollywood Hulk Hogan' for the other - we decided to wear costumes we already have for one of the days to cut down on costs - but we are going to look awesome all weekend! Friend B is going as Rapunzel from Tangled the same day I go as Belle, and as Cersei Lannister from Game of Thrones for the other day - she is going to look beautiful and I am sure she will let me show you pictures come July! Are any of you going to a Comic Con? Or have you cosplayed before? This is my first time and I am so excited! Any hints do throw them my way!!! Thanks to S at work for the push to do this - so far only Spiderman is on there but I plan to make lots more and also post up the other things I've made but don't know how to photograph just yet! 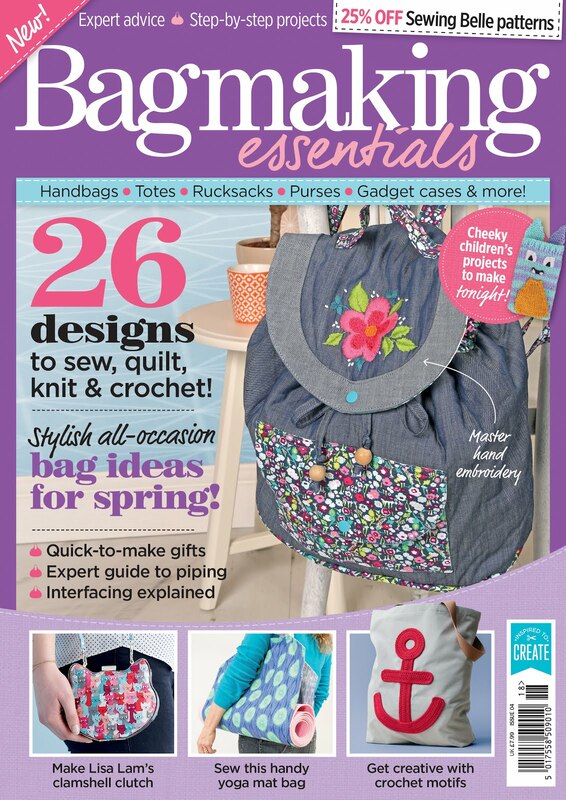 One more thing ticked off my list - now to continue updating my blog (pages, layout, links), now updating my Etsy shop, set up a prettycolumn Facebook page, and type up the Spiderman pattern! I've decided to do all these things in smaller steps rather than one big session to break it up a bit so blogging keeps the fun that I've discovered and so that it doesn't start to feel too much like homework! On this high though I'm signing off my laptop for the evening - all I want to do is get my jim-jams on and play some serious Ni-No-Kuni!!! Have a look at my shop and let me know what you think would you? You're a star! I have to admit I'm not keen on the phrase/hashtag Throwback Thursday - no particular reason I've just never rated it. However having only begun this blog just over a month ago and having been knitting and crafting for years before that, there are a lot of projects I have worked on and completed in the past and (unfortunately for me) a 'Throwback Thursday' post every now and then is the best way to structure sharing these creations with you! And so let me introduce you to a snippet of my Totoro soft craft creations! For those of you who don't know My Neighbour Totoro (1988) is a Studio Ghibli animated film that is amazing and easily my favourite Ghibli film. Totoro's are friendly, cuddly, good-natured creatures of the forest and just have such a wonderful look that is easily transferred to crochet and knitting. Pictured above and to the right (albeit it slightly poorly) are a pair of crochet slippers which I adorned with my very own free-hand crochet motifs of the iconic grey Totoro, the blue Totoro carrying his sack of acorns, and the little white Totoro. The pattern for the slippers came from Zoom Yummy. The above two Totoro's are patterns from the brilliant designer Lucy Ravenscar and can be downloaded for free from her Ravelry page, Grey Totoro is my favourite Totoro creation and I made him because I desperately wanted a plushie Totoro but couldn't justifying buying one online - crocheting one was much cheaper and more rewarding! Perfect cuddle sizes. So this Easter Sunday I devoted to writing a pattern for my crochet Spiderman (pictured above) that I made off the cuff last year for a Valentine's Day present for B. It was my first ever go at making something without a pattern and I was so pleased with it that I actually went ahead and made a Rogue from X-Men too! I haven't included a picture of Rogue this time round as this is all about Spidey, but you will get to meet her in time. Once I made Spiderman and was pleased with him I was inspired to write patterns for as many Marvel superheroes and villains as I could with the intention of selling the patterns as sets - that was a year ago...needless to say I was very successful at putting that particular plan off for a long time! Then I started this blog and I was inspired to look at my hobbies in whole new ways - namely ways I can share with others and what better thing to share than that which I wanted to a year ago! And so I took Spidey back from B and began to remake him writing notes as I went. I found writing the pattern a lot easier than I anticipated and I have tested the pattern out on the black version of Spiderman (it was going to be Venom but he isn't large enough) and it seems successful. I think once you have been crocheting and following patterns for so long you start to just know what the increases need to be in rounds to get a certain shape - that is at least how I feel, what do you think? And so I have made Spiderman and here he is! He looks SO much better than the one I made last year which is such a pleasure to see the leaps and bounds my crochet skills have made. I have also in note form the pattern to make him and the version for the black Spiderman (who of course won't require the colour work you see on the body and limbs above). I will test the pattern one more time on a second Spiderman and then will type up and publish! 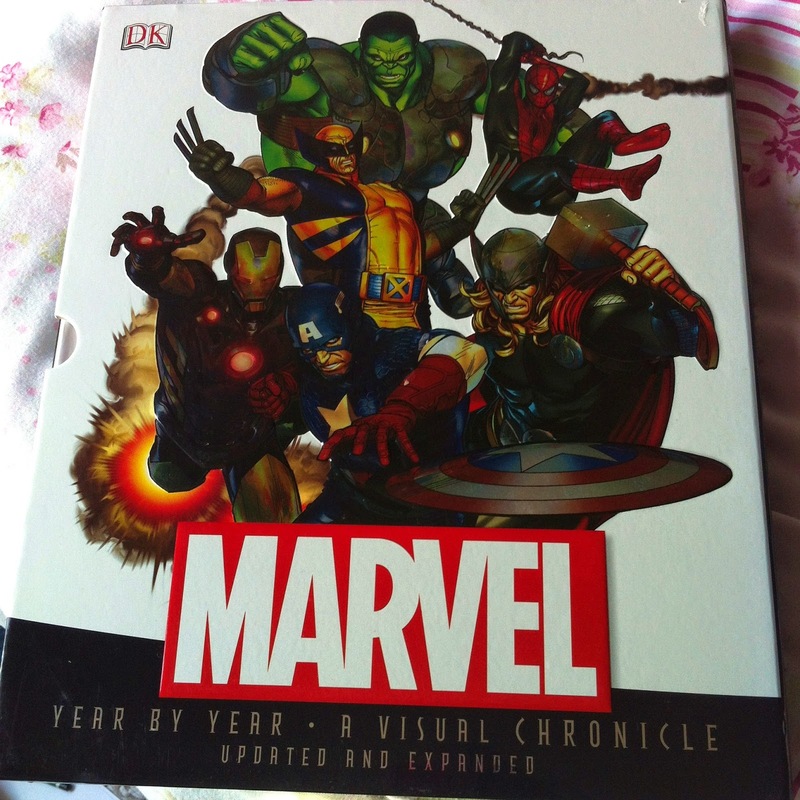 I am very excited that I have finally achieved this (long awaited) goal and can't wait to get started on other patterns for Marvel characters - I will be doing Rogue or Storm next I think so watch this space! Any thoughts on Spiderman and on who I should crochet next? In the last 10 minutes of Sunday (I am seriously pushing the title of this post!) I really really wanted to quickly share with you what I have been doing this bank holiday weekend while B has been away at camp in the Lake District and I needed to distract myself with muchos crafting! 1 - I completed my #DICraftSwap project, much sooner than I meant to as I was an eager beaver and have even made a quick little extra - holding off posting it for a little while to make such I've done the best job I can! 3 - I painted Kilner jars following a blog tutorial from la petite pie - one for a birthday present, one for my sister, and one for myself and I am thoroughly pleased with the result! Absolutely gorgeous and so quick to do, and the paint was barely touched so I even repainted my mirror frame and I have plenty left over for future jars. I seriously recommend doing this project. perfect for make-up brushes, though now I have made it into yet another pen pot! 6 - I began writing up my Spiderman crochet pattern I AM SO EXCITED (dare I say it is going easier than I thought) but I'm planning a more in depth post in the future, and with any luck will set-up my Etsy store tomorrow and the pattern will follow in a week or two! 7 - I gave my blog a little redesign, not how I envisioned it but I feel it is a promising start - what do you think? PHEW thanks for reading that if you didn't get bored! What have you been up to this bank holiday weekend? Have you got any hints and tips for me when it comes to the image of my blog? Links to templates? I would really appreciate any help and tips more experienced bloggers have to offer! This week I have been working away at my first ever craft swap - being my first I'm nervous at not making a good impression so I'm putting in a lot of effort - and loving it! However I've run out of the correct colour of yarn (ack) and so in the meantime I thought I had best get my first game review up on here! Symphony of the Origin (Kemco Games) is a turn-based RPG made exclusively for android devices, marketed on the Google Play Store as for smartphones. However for Christmas I received a Lenovo Android tablet and desperately wanted to get some games on it, and for £3.99 and good reviews it was a safe bet! The story follows Ryle and companions (elves, humans, dwarfs, and more) as they travel the world in true RPG style battling monsters and completing quests, with the ultimate aim of defeating the Evils and Dark Elves. I love a classic turn-based RPG and this game does not disappoint. It boasts classic game graphics that remind one of early Final Fantasy games but with the sharpness and speed we come to expect with 21st century game play. The battle system is easy enough to follow, though explanation and implementation of the special attacks using stamina leaves a little to be desired - having played the game for almost 4 hours I only just realised which bar reflects the special attacks, and looking to the in game instructions it wasn't cleared up greatly. However I'm happy to supposedly have unlimited stamina to use special attacks! I've now played the game for 6 hours and it looks like there are plenty more hours of game play to get through yet, which gives the price-tag of £3.99 good stead. I may be changing my tune once it comes to the end of the game however (who knows it could be within an hour of game play!) but right now I am quite content. One problem I do have with playing on my tablet though is the placement of the joy stick (see the bottom left of the picture above) - it could do with being just a little bit closer to the edge of the screen so my thumb doesn't have to stretch quite so far for hours at a time! When I play games I play almost exclusively for story, I love stories in RPGs (and unlike a lot of Final Fantasy fans I know, I have loved that Square Enix gave us 3 brilliant games focusing on the story of FFXIII - but that is another story...) and I am in two minds about this one. It is quite straight forward - misunderstood, clearly attractive male protagonist, beautiful love interest of a different race, and quirky characters that misunderstand everything, all battling a clear baddie. However I think this is to be expected of a game created solely for smart phones and although there isn't a great deal of depth (so far) in the story, I don't find it wanting and I am interested in completing the next area and defeating the next boss to find out where the story is going. Area layouts and boss battles are quite predictable in this game, but that is all part of the charm I think of an easy to play RPG that doesn't require 100% of your attention when you play - I bought this with the hope of having a game to play when there is no Internet to hand or if I'm watching TV that I am not that interested in, and I've got it! I'll give this game a resounding 4 out of 5 - sometimes the dialogue is just too cheesy/poorly laid out, and the story could have better promise, but as basics go I am thoroughly impressed with this game and hope I will be all the way to the end! 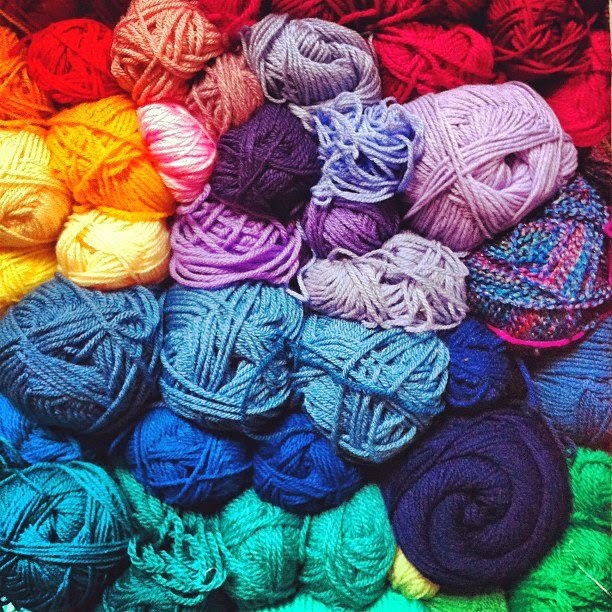 inspiration may come from anywhere - including my yarn stash! I must admit when I first saw the craft swap on Hannah's blog after following her after my first #CraftBlogClub I was a little apprehensive - felt like a big step to throw myself out there a little bit and to offer to send my creations to a stranger, but now I am so excited to see what I can do, to see what I receive and to see what others do too! I'm also keeping my partner a secret for now to see how well I can interpret her likes from trawling through her blog :) keep an eye out for updates on the swap!! This week I joined in with the #craftblogclub - a weekly twitter conversation every Tuesday from 7-8.30 for craft bloggers, hosted by @CraftBlogClub @LivePeachy - what a grand idea! I was a little shy this week as having only begun blogging over a week ago, but I quickly joined in for 20 minutes before the Sewing Bee final and followed some new people, gained some new followers, and already been introduced to some lovely blogs and had some great words from strangers - who hopefully over time will become a network I'm a part of and can share blogging tips together! Here's to next week! Following this of course it was the final of the Great British Sewing Bee - congratulations Heather! Though in my heart of hearts I really wanted Chinelo to win as she has been consistantly strong throughout the series and always had such flair and creativity! But as Patrick so rightly put it, Heather has been quietly putting in the work - if only Chinelo had got that tie right! Commiserations too to Tamara - always enjoyed her creations so much as well! Hopefully now I will be able to join in #craftblogclub more readily (particularly with no more GBSB to watch *weeps*) and look forward to speaking with you other bloggers soon! 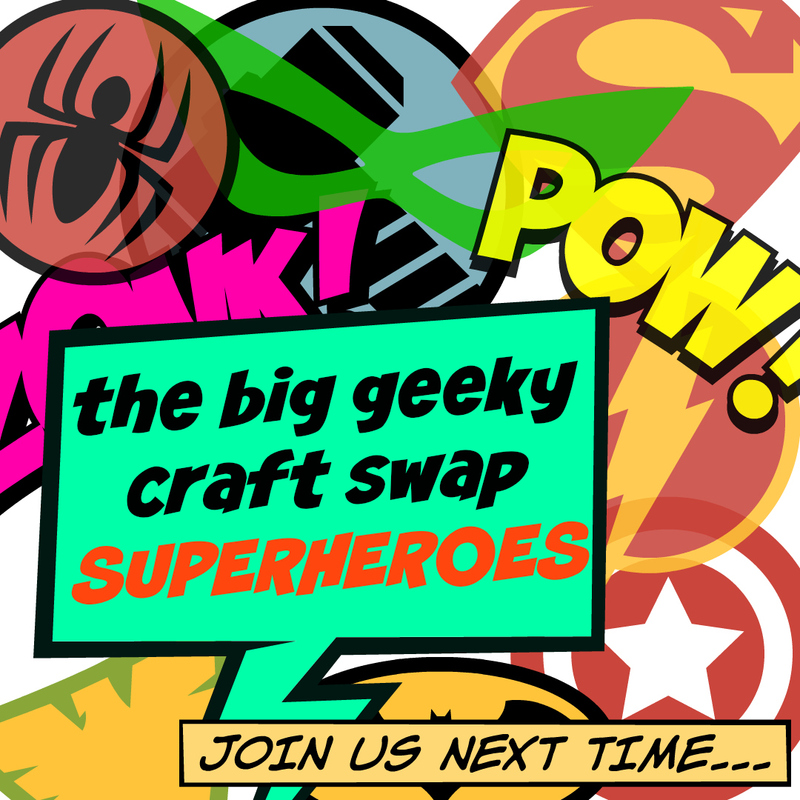 If you've networked successfully via #craftblogclub I would love to hear your thoughts on what is clearly a grand idea! I, like any other crafter, have several ongoing projects that I work on a little bit here, and a little bit there with no rush to neccesarily finish them. One of those projects is my sky scarf. 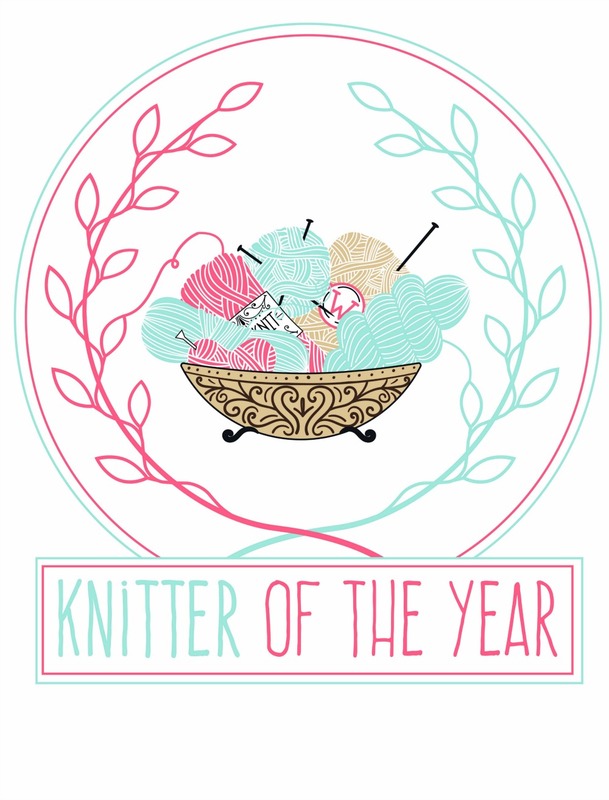 It does exactly what it says on the tin; everyday for a year you simply knit the colour of the sky, giving you a beautifully gently coloured 5-foot long scarf at the end of the year. I started this scarf at the end of January when I was looking at my yarn stash and thinking to myself I could really do with using some of this up - what shall I do? A friend had shown me the project a few months ago (unfortunately I can't remember who so I can't thank them!) and so I looked it up and decided to give it a go! It is very easy to fall behind on a project that requires you to wait til every new day to carry on knitting and sometimes life and other projects just get in the way and I forget to carry on. However I avoid this by every morning while I eat breakfast before work by writing a quick note of what the colour of the morning sky is on that date, so then I can come home and knit that same day, or even leave it for a few days and then I have a unique pattern to work from to catch the scarf up (and I will end up with a sort of sky diary for the year, which is interesting in a light sort of way). I wouldn't recommend leaving this longer than a week though as just knitting greys and whites (as is to be expected with Northern English weather) can get a little boring. If anyone else is currently knitting a sky scarf - let's compare! Or hopefully I've inspired you to give it a go; the pattern is straightforward, elegant and effective, ideal for beginners looking to take on a project, or for any skill level of knitter who want to make a truly unique scarf for themselves. 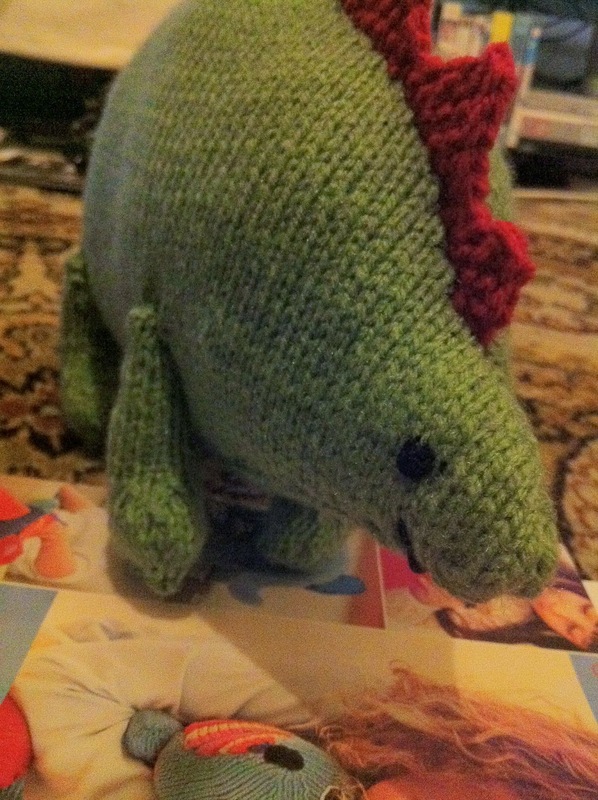 As promised on Sunday, here is the dinosaur that I knitted! Named by my Dad, please say hello to Steve the Stegosaurus! 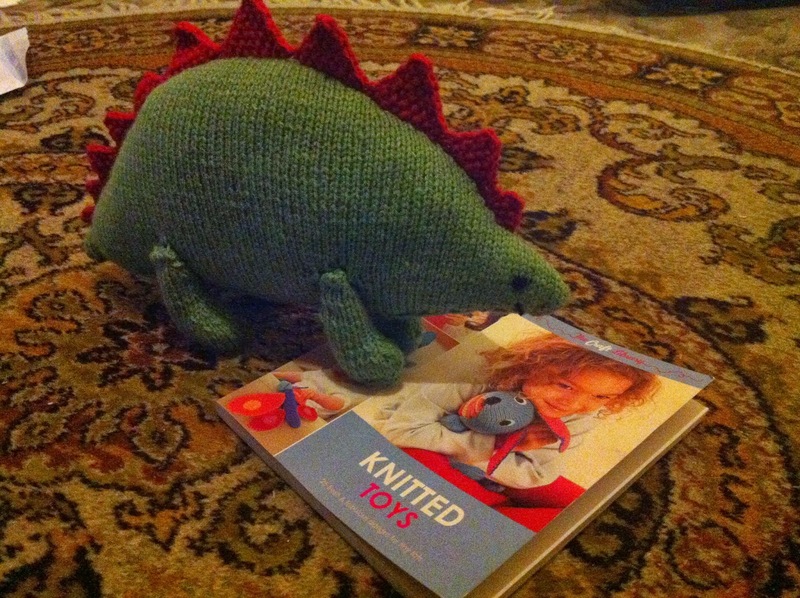 The pattern came from a book that B bought me for Christmas - The Craft Library Knitted Toys by Zoe Mellor (2011), an adorable collection of 25 patterns for knitted toys. 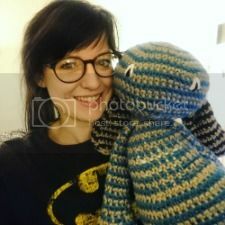 I really love knitting and crocheting toys, they are very satisfying to complete, have a real rustic/homemade look to them, and it is also very easy to hide mistakes in the knitting if you are prone to small errors (as most knitters are) - you can always make it look like it was meant to be there! Until I can perfect my jumper knitting skills I will be knitting many a toy - I don't have anyone to give these as gifts, and I think B would like it if I stopped hoarding toys in my room...I may decide to sell this little fella when I get stuck into craft fairs properly. I would say this pattern is ideal for beginners looking to perfect working with smaller needles - it is worked on 3.75mm straight needles (I used 3.5 as I don't seem to have 3.75 handy...) and uses simple increases and decreases with stockinette stich, while the spines are worked in the less used but effective moss stich. You can buy the book from Waterstones - couldn't find it on Amazon - for £8.99. In other news B brought over the SLR that we bought a couple of years ago, so with any luck and some practice I will start posting much better quality photo's of the things I make! This week I have set myself the challenge to work out a pattern for some mini X-Men/Marvel comic characters I have crocheted free hand in the past, and to type up some headband patterns I wrote over the last few months. Keep an eye out for some patterns from me soon, or maybe perhaps just some more idle ramblings while I get stuck in to this blogging milarky!